One of my top priorities as secretary of agriculture over the past eight years has been to rebuild, reinvigorate and modernize the American rural economy. The robust communities that form the fabric of rural America are too often overlooked and undervalued, particularly by institutional investors. While production agriculture remains vital to the rural economy, there has been an explosion of innovation in fields such as renewable energy, biofuels, technology, conservation and rural infrastructure. This activity presents a tremendous opportunity to invest in creative solutions to combat climate change, increase sustainable food production and protect our nation’s natural resources—all while continuing to bolster the U.S. economy. Despite this era of both revitalization and ingenuity, our rural communities—while facing disproportionate challenges in infrastructure, utilities and community facilities—also face needed access to traditional sources of financial investment. USDA itself is a significant source of these investment dollars, but the demand for rural investment is greater than we can supply. That is why we are striving to identify creative ways that we can work with the private sector to be more involved and aware of development opportunities in non-urban centers. We need the expertise in debt and equity investments that ABA member banks provide to be focused on rural areas. We can learn from your ability to manage returns and maximize impact. Nearly 60 million Americans reside in America’s rural communities—one-fifth of the total U.S. population. The 2010 census also indicates that roughly 3.25 million square miles of U.S. land lies within rural areas, representing approximately 97 percent of America’s entire acreage. While this data demonstrates the significant breadth of rural America, it cannot capture the value system ingrained within these communities, which serves as a foundation for our society as a whole. The morals and work ethic of rural Americans ensure that our vibrant economy is maintained. It is time for us to work together toward exposing the bold future that rural America has in store for young people—and their children and grandchildren. 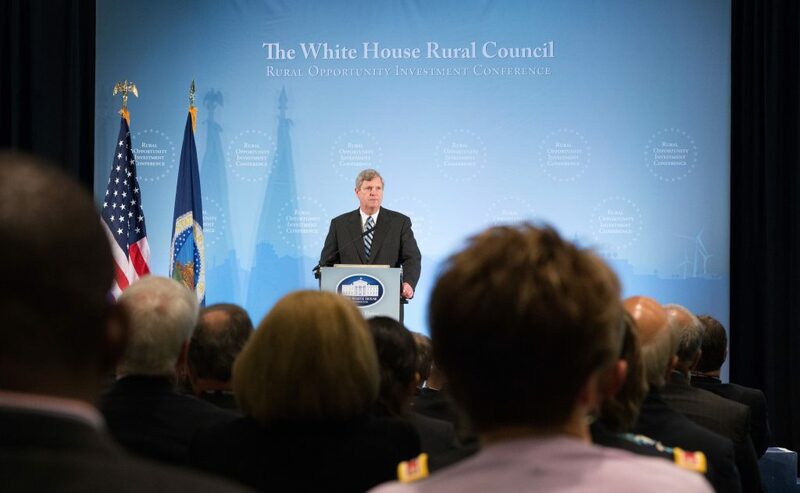 Agriculture Secretary Tom Vilsack announces the creation of the new U.S. Rural Infrastructure Opportunity Fund through which private entities can invest in job-creating rural infrastructure projects across the country. An initial $10 billion has been committed to the fund with greater investment expected to follow. Target investments will include hospitals, schools and other educational facilities, rural water and wastewater systems, energy projects, broadband expansion, local and regional food systems, and other rural infrastructure. USDA has been a champion for rural economic development for decades through its multi-billion dollar portfolio of grants and loans. Taken with investments made since FY 2009, USDA Rural Development has now invested more than $224 billion in more than 1.2 million projects in rural communities nationwide, supporting areas including housing, community facilities, rural water and wastewater services, broadband and rural electric services and rural businesses and entrepreneurship. In FY 2015 alone, USDA Rural Development invested $29.75 billion in nearly 171,000 projects across the nation. Over the past four years, USDA has continued to develop a bevy of partnerships and programs that will drive new interest and investment into rural America. Many of our lending programs permit partnering with other parties, and we believe that financial institutions can complement the government’s work by serving as a co-lender when our resources or authorities limit our ability to invest. We are anxious to expand the number of opportunities for banks to co-lend and participate directly with USDA in loans for rural projects. In 2014, USDA announced the creation of a new $154 million Rural Business Investment Company. The RBICs are managed through the Rural Business Investment Program and allow funds to be licensed to invest in enterprises that will create growth and job opportunities in rural areas, with an emphasis on smaller enterprises. The RBIC vehicle allows USDA to facilitate private equity investments in agriculture-related businesses, above and beyond what our direct and guaranteed loan programs are able to provide. Small, regional and large banks are permitted investors in an RBIC—and such investments can be a source of coverage under the Community Reinvestment Act. To provide a flavor for the types of companies in which these funds are infusing private capital, consider the recent investment of $5 million in Hortau Corp., deployed through USDA’s first fully licensed RBIC. Hortau is based in California’s characteristically rural Central Coast, and since 2002 has been on the forefront of creating soil monitoring and irrigation management technology for agricultural systems. Given the ongoing drought plaguing the West Coast, particularly California’s agricultural regions, Hortau’s technology is transforming how producers maximize their use of water. Their simple, yet powerful, mobile software is providing farmers with real-time reporting on the health of their crops so that they can detect stresses in time to mitigate negative impacts. With a few more RBICs currently in the pipeline, we are on a good path forward in matching these types of pioneering companies with private sector investments that will facilitate lasting economic growth in our rural communities. Rural America is undergoing a period of renaissance. While many people discount the economic opportunities within non-urban areas because these communities face unique challenges, I’ve strived to reveal the opportunity side of rural America. New innovations in areas like precision agriculture have bolstered the rural economy—which is the foundation for a healthy American economy. USDA wants to be in the business of helping you invest in those kinds of opportunities so we can bring manufacturing and production opportunities back into rural America, and so that we can also provide opportunities for smaller-sized operators to be able to profit and stay in business. Now is the time to make a difference in reenergizing our rural communities. The keys to our nation’s future depend on these investments in farmers, makers and innovators, and in increasing opportunities for families. You can help. Tom Vilsack has served as U.S. Secretary of Agriculture since 2009 and is a former governor of Iowa.